A regular question asked by parents concerns the second year of preschool. Children typically spend one year in each grade level—so why an extra year, sometimes two, in preschool? What happens in that second year that’s different, when the basic curriculum and probably the teachers stay the same? • The experiences, though falling into familiar categories: story dictation, hiking in the woods, name-writing, pretend play, being read to, painting in the studio—are not the same the second or third year. • The children are not the same. We know that three year-olds are different in many ways from fours and fives. They experience the very same room, classmates, and teachers in completely different ways. Threes are more interested in the environment and the teachers than fours and fives. Threes need to make a trusting connection with the teacher in order to separate from home. Toys and materials are more intriguing than other children, who often are seen simply as competition for these desirable objects. For fours and fives, peers are all. By the second year, most children are very comfortably connected with the teacher, and enjoy checking in and receiving comfort only when needed. 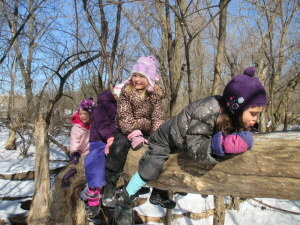 But interaction with their friends, either in dramatic play or use of materials, tops the list. Since learning is not linear and most closely resembles a spiral, children need similar experiences, repeated at different times, in different conditions, with different people. Tapping trees for sap can be done multiple times with different concepts internalized each time; increased motor skills allow drilling into the tree, new observations are made and a deeper understanding is now possible. 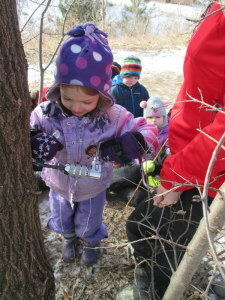 Maybe the child had anxiety the first year about tasting sap dripping from the spile, but is ready to do it the second year. Last year, he lost interest in checking the pails daily to see if the sap was finally flowing, and the second year, because of his more mature understanding of the process, is the first one down the hill every day, to peer excitedly into the pail. And when that sap is poured into the big bucket and then into pans on the stove to cook, the final delicious product poured over pancakes can be connected to that water-like drip from our very own trees. Hiking for second years can bring new discoveries because less energy is used up trying not to trip on roots, pushing brush out of the way, being cold, not liking getting wet or muddy, or being freaked out by bugs or burs on socks. With second-year courage and confidence, worms and box elder bugs are held and closely investigated. Once unable to climb up to the high fallen branches, veterans now shinny along to the very end, climbing over bumps on the log, loving the view from up high and being admired by the younger students below. They’re leading the play rather than following, being the first to find the perfect pirate hideout or nest for the baby birds, and laying out the scenario for others. Rita Thoemke, one of our teachers, brought her school-age daughters recently to spend the day. She was interested to hear their comments as they joined the preschoolers’ color mixing activity. “Hey, we’re doing this at our school, too. We’re mixing primary colors; red, yellow and blue, to get the secondary colors; orange, purple and green.” The teachers then remembered that the first attempts at this activity produced only muddy brown, as the youngest children dumped all the colors together. This time, the children who had had previous experience with the droppers and water paint, had moved on to intentional placement of the colors, one by one, for (mostly) predictable results. Maybe the most dramatic development we see in the second year involves pretend play. Four and five year-old play looks strikingly different from that of threes, and is lead by children who have developed the skills of self-regulation, articulation and vocabulary, inclusion, and accommodation to others’ needs. The second year gives them the maturity to listen to their friends’ ideas and the ability to incorporate them into the play with a deep understanding of particular roles and stories. 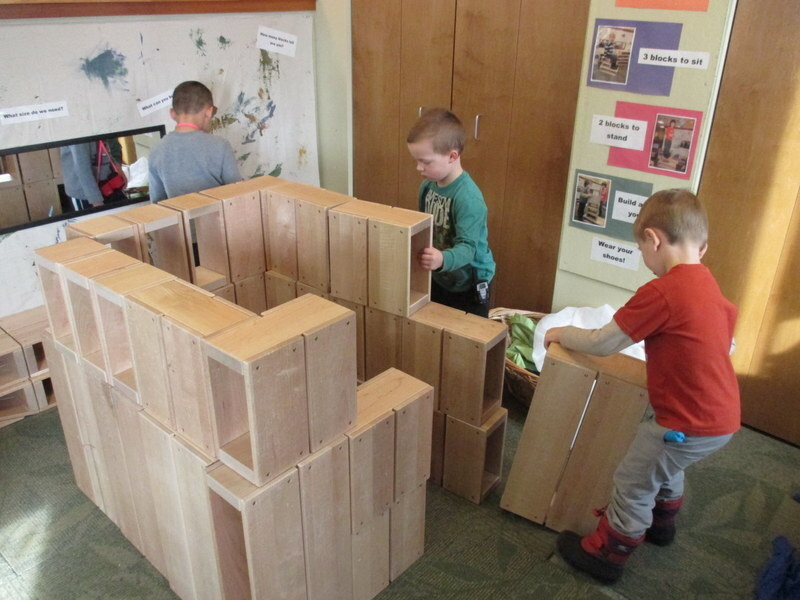 Lev Vygotsky, a Russian developmental psychologist in the early 1900’s, who has greatly influenced our understanding of early childhood development, believed that children function at their highest level of development during pretend play. No other activity has the potential to ask so much of their social-emotional, cognitive and physical abilities. Vygotsky wrote “…the internalization of new understandings, or ‘cognitive restructuring,’ occurs when concepts are actually transformed and not merely replicated.” This process takes time and the optimal environment. Internalization takes place when children interact within the “zone of proximal development,”—that place between what a child can do on her own and what she can do with the help of adults or more competent peers. Providing an environment where a child can function in this optimal space—being appropriately challenged, reaching mastery, challenge, mastery, over and over—promotes growth and satisfaction. “Instruction aimed at a wide range of abilities allows the novice to learn at his own rate and to manage various cognitive challenges in the presence of ‘experts.’” This “zone” exists quite naturally in mixed age classrooms like ours, and the benefits of this kind of setting are more evident in the second year, when children are intensely focused on their classmates, and learning through play is at such a complex, mature level. These opportunities take on even more value when placed in the context of many of today’s kindergarten classrooms, which offer neither the time nor the environment for this important growth to happen. The “zone of proximal development” is alive and well at All Seasons.